Location of the Halmahera Sea within Southeast Asia. Halmahera Sea is a regional sea located in the central eastern part of the Australasian Mediterranean Sea. It is centered at about 1°S and 129°E and is bordered by the Pacific Ocean to the north, Halmahera to the west, Waigeo and Irian Jaya to the east, and the Seram Sea to the south. It covers about 95,000 km and its topography comprises a number of separate basins and ridges, the chief of which is the Halmahera Basin reaching a depth of 2039 m.
On the North A line from Wajaboela (Morotai) to Tg. Djodjefa, the Northern point of Halmahera. On the East. A line from Tg. Gorango, the Northeastern point of Morotai Island, through Sajang and Kawé Islands to the Western extremes of Waigeo and Batanta Islands across to the Northwest point of Samawati Island, down the coast to Tg. Menonket its Southwest point, and thence to Tg. Sele, New Guinea (1°26′S 130°56′E﻿ / ﻿1.433°S 130.933°E﻿ / -1.433; 130.933). On the South. The Northern limit of Ceram Sea between Obi Major and New Guinea [A line from ... Obi Major ... Tanjong Seranmaloleo its Eastern extreme, thence through Tobalai, Kekek, Pisang and Kofiau Islands to Tanjong Sele (1°26′S 130°55′E﻿ / ﻿1.433°S 130.917°E﻿ / -1.433; 130.917), the Western point of New Guinea]. On the West. 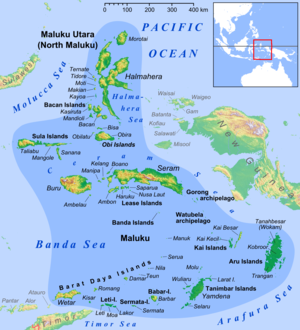 The Southern limit of Molukka Sea [sic] between Halmahera and Obi Major [A line from the Southern extreme of Halmahera to the North point of Bisa (Setile) Island, thence to the Northern extreme of Obi Major]. This page was last edited on 8 September 2018, at 07:16 (UTC).